A break from all things house today. I'm spending the afternoon canning blackberry syrup from frozen blackberries picked last summer. Also have a recipe for blackberry vinegar from the leftover pulp. Blackberry scones are also on the agenda. Yum :-). Later that same day......ok, I lied. I snuck a house thing in. I got a call that my new center post fitter light is done. So, I ran downtown to pick it up. It turned out great, I think. I posted a picture, but it doesn't do the shade justice. 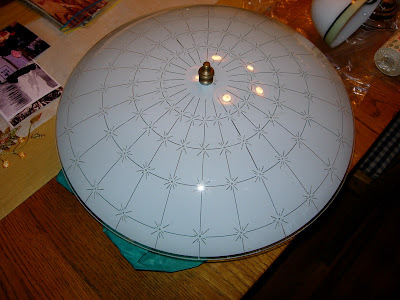 The salvaged glass shade looks very cool with light shining through it....kind of like little shining stars. The center post fitter is unlaquered brass which will age to a nice patina. It dawned on me that I kind of jumped into this new blog without giving much of an introduction. For those that visit my website and don’t know me, here goes. For 11+ years I lived in a 1928 condo and all was well. It was cute as a bug. However, it grew small over the years. It also was finished. Everything was original. There was no restoration to do. None. All I could do was repaint every few years. The neighborhood had also turned “trendy” and I was increasingly unhappy with the snottiness factor. So, one day I decided to move. I found a 1924 bungalow on the other end of the city. Oddly, it was the same color and paint combination as my condo. It still had the original kitchen. It had oak & maple floors. It had been pretty much left alone. But, happily there was still work to be done. I went to look at the house with my realtor, called my dad to come over immediately (he’s a structural engineer) to give me an assessment. Before the end of the afternoon an offer was with the seller. Yeah, it was mine! I moved in the end of Oct. that year. I woke up the first morning upstairs with a terrible sore throat and eyes swollen shut from allergies and asthma. Icouldn’t move from bed except to call my mom and tell her I was in bad shape. Turns out the upstairs had not been weatherized in any way. Thus, the cold. And two hairy dogs had left their calling card in each and every vent of the gravity heating system, carpet, walls, etc. Thus, the over-the-top allergy reaction. My retired mom & dad appeared at my front door with Swiffers, cleaning supplies, 3M window weatherproofing plastic and a HEPA vacuum cleaner and spent the day helping me not regret my decision. I called my out-of-town allergist and begged him to write me a new prescription for all of the drugs I hadn’t taken in years. I remember laying in bed that night thinking about the colossal mistake I had made. Then the projects started J The first project was a thorough vent cleaning (who knew it would be so hard to find someone that would work on a gravity furnace). I didn’t know whether to be embarrassed, fascinated or disgusted when the cleaning guy gagged a little and then admitted to me that he had never seen vents that dirty (except the time a family had hamsters that got loose). My next project was the front door (pictures on the website) and my stained floors (story & pictures on the website). Spent yesterday on house stuff. My first stop was a local lighting store. I had been to this place before enroute to a huge antique store that used to housed in the basement. I had spoken to the owner briefly and they told me they could replicate any older style lamp or repair vintage lights. So, when I finally decided to replace my hideous fake stained glass hallway light, I decided this might be a good place to look. Lightworks Lighting The store carries a fairly large selection of restored vintage lights and shades. When I described to the owner what I was looking for this time (I have an old glass shade that I bought at an estate sale and need a center fitter), she brought out a bunch of lamp parts and samples of finishes. 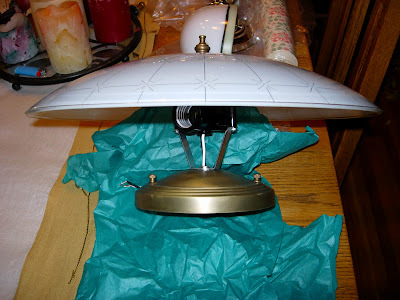 I was able to piece together the lamp I wanted piece by piece...down to the finial. It will take 2 weeks to pull together and they make it on site. Pricewise, the end product is similar to Rejuvenation, etc......but I had a hand in creating it. Fun! On the way home from my sucessful light venture, I stopped in the local dumpy salvage store. The help (using the term loosly) there is surly, but occassionally there is a deal to be found there. Down one dark aisle and piled below some type of marble countertop....I spotted a free standing cabinet that closely matches those in my 1924 kitchen. Birch or maple, I think. It was small...two cabinet doors & 2 drawers. I have been looking for an extra storage solution. Anyone who has seen my kitchen knows the urgency of my storage crisis. The cabinet had been ripped out as the sides were not finished....and the top was missing..no hardware. "Dingy" would be kind. For this they wanted $175. Yikes. There is a sale on Thurs that will discount things 50%...but even at $85, I think it is overpriced. It would take a lot of work to even look presentable. Sad, because it really would look cute in my kitchen...assuming I could figure out a way to finish it off. Oh well, may keep an eye on it and see if it gets marked down even more. What fun would it be if there was no challenge? Finally I stopped at Franks Plumbing. They carry vintage bathroom fixtures. When in the neighborhood I always like to stop and see what they have. They aren't cheap, but they know their stuff. Saw a nice bathroom pedestal sink for my bathroom. Will have to keep it in mind. As an added bonus, the guy working was able to tell me what those little holes are under my kitchen wall sink (my theory was sink legs or a towel holder). Alas, they were to add additional wall braces. I also asked him if he knew anyone that refinished old stoves locally (my ongoing quest/saga/holy grail). He gave me the name of a place down the street. I didn't have time to stop, but will call them later.